I’d like to think that I have a pretty good pulse on the many smaller restaurants in San Antonio. However, I was taken to school after asking Gustavo Arellano, author of Taco USA and columnist who lives on the West Coast, some of his favorite San Antonio restaurants in a recent interview. Turns out that I hadn’t been to most of the restaurants he suggested (and my trip to Mi Tierra was when I was a kid), most of them staples of San Antonio. Rather than hanging my head in shame, I knew I had to get out there; Ray’s Drive Inn was the first stop. Ray’s Drive Inn – the birthplace of the puffy taco. 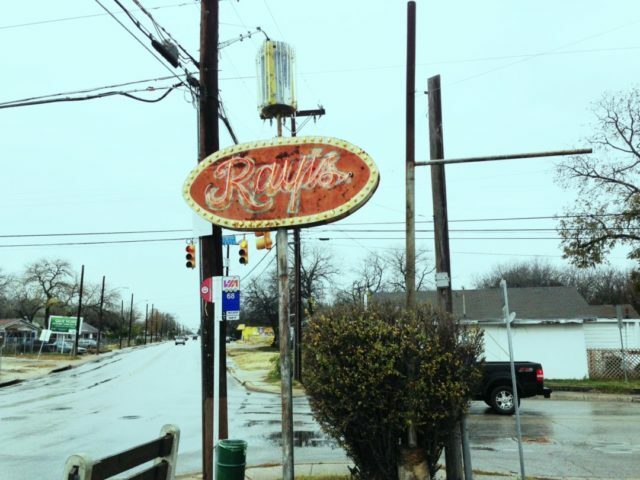 Located on the Westside, Ray’s first opened in 1956 in a former ice house and has been a go to place for Tex-Mex ever since. According to the menu, Ray sold his restaurant to his younger brother Arturo who was living out in Southern California. This move proved to be fortuitous because Arturo introduced a new item to the menu that would make the restaurant famous – the puffy taco. While I associate Henry’s with puffy tacos, it turns out it was Ray’s Drive Inn was the original creator of the dish – Henry is Arturo’s younger brother. Becoming the unofficial taco of San Antonio, Arturo trademarked the name “puffy taco” in 1992; the restaurant has gone on to serve over 500 puffy tacos a day, and until recently, I was never one of those people. This changed this past week when my friend and I dropped into Ray’s Drive Inn. The restaurant embodies hole-the-wall; an old school building that was particularly drafty on the cold day that we went in. The inside is decorated with paintings by different artists and tons of San Antonio kitsch – from old advertisements to pictures of Henry B Gonzalez. In a corner is an old jukebox, which was silent when we walked in, but began playing Michael Jackson’s Thriller once we were seated. At that moment I knew we were in for something good. The Mexican plate: two cheese enchiladas, carne guisada, puffy taco, rice and beans. When our waitress brought out the dish, the jukebox jumped back to life playing an old mariachi tune – was this thing possessed? – and we started eating. 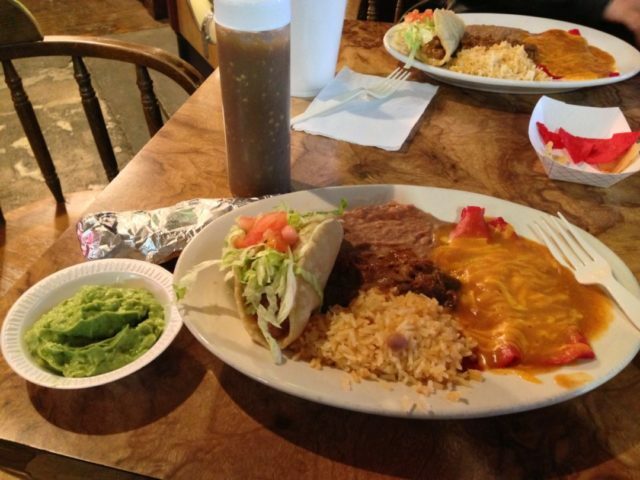 If a puffy taco is any part of a meal, San Antonians know to tackle that item first: you are on a 30 second-or-less timer before the light crisp of the corn tortilla because saturated with grease and disintegrates in your hands. As soon as you see your waitress coming towards your table, your napkin should be unfolded, ready for you to go to work. This turns out to be unnecessary at Ray’s Drive Inn. I was impressed that the puffy taco was not dripping with grease, and the puffed out, lightly fried tortilla held its shape well after the 30 second time limit. The meat was good, and the texture that makes a puffy taco so amazing stayed with it throughout the duration of eating it. The repetition of making 500 puffy tacos a day for several decades must be how Ray’s Drive Inn has perfected the puffy taco. The carne guisada was delicious, and I made a guisada, bean (the refried beans were incredibly flavorful) and rice taco. For a little extra zing, throw on some of the reddish, brown salsa that comes in a squeeze bottle. The heat is sneaky and lingers in your mouth well after you eat it. The cheese enchiladas and the guacamole turned out to be pedestrian at best, but it all worked out because the rest of the plate was so delicious. When you stop by at Ray’s Drive Inn, stick with what they do best: the puffy taco. And be sure to go after work or on the weekend so you can do it right, with an ice cold beer.